WESTBURY, NY--(Marketwired - December 15, 2015) - Automobile technicians need all the help they can get when trying to locate those elusive, pesky refrigerant leaks. Tracer Products manufactures a variety of technologically-advanced, budget-friendly, efficient, easy-to-use fluorescent leak detection kits that address this problem. Finding leaks quickly is not only beneficial to the technician and customer, but it saves the environment from harmful emissions. 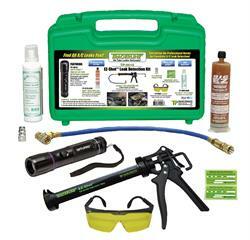 One such kit is the Tracerline® OPTI-PRO™ EZ-Shot A/C Kit (Part No. TP-8616), which makes it easy for technicians to find all air conditioning leaks the first time and every time. 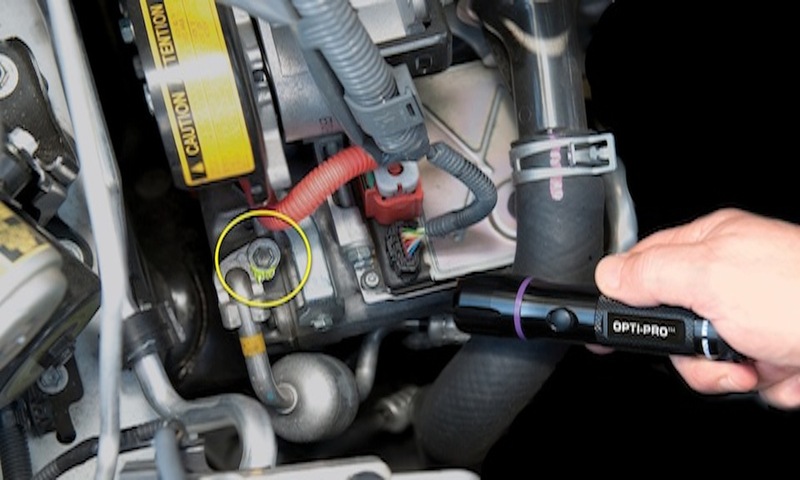 At the heart of the A/C kit is the OPTI-PRO™ -- a cordless, "true UV" (violet light) LED leak detection flashlight that provides optimal fluorescent dye response and contrast so all leaks glow brilliantly. It works with all Tracerline® universal/ester and PAG A/C dyes. The flashlight has power comparable to high-intensity 100-watt lamps, with an inspection range of 15 feet (4.6 m) or more. Powered by 3 AAA batteries (included), it has a 100,000-hour LED service life. 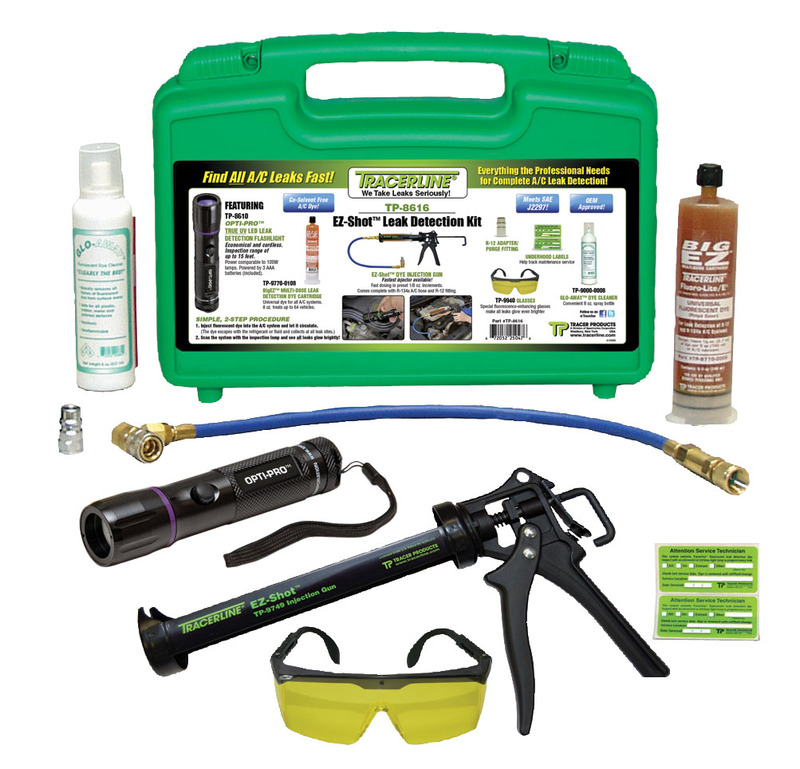 Also included in the leak detection kit are an EZ-Shot™ A/C dye injection gun with hose and coupler, an 8 oz BigEZ™ universal A/C dye cartridge for servicing up to 64 vehicles, an 8 oz spray bottle of GLO-AWAY™ dye cleaner and fluorescence-enhancing glasses. All components are stored in a rugged carrying case. 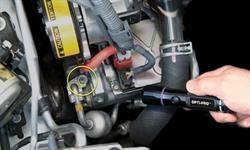 Video on "Tips for Finding A/C Refrigerant Leaks"
Video titled "The Tracerline Advantage"